I stayed at hotel Wutma in the Piazza area in Addis Ababa for 60 Birr / night about 8 US dollars. This is a small nice budget hotel with a clean room and hot shower. It was in the end of my traveling around Ethiopia and had five more days before flying home. I was at the Piazza then a young man said, do you know me? My answer was no! He said, I am working at hotel Wutma there you are staying. I had not seen the man before. He said, what are you going to do in Addis Ababa? Well, I don´t know? He said, why not rent a car and drive down to the Rift crater lakes? 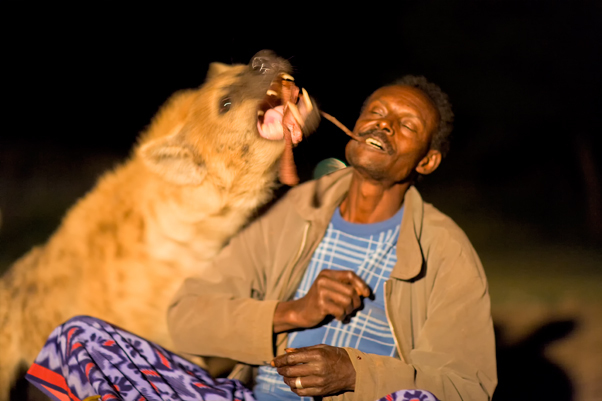 The hyena man feeds a hyena with meat from camel outside the city walls of Harar in Ethiopia. This tradition started about 1950s some says it even goes back to the great famine during the 1890s. The famine force the hyenas around Harar to attack livestock and people. The people started to feed the hyenas with porridge to avoid the attacks. Later one started to predict the year a head if the hyena ate half of the porridge it would be a good year, if the hyena refuses to eat famine would struck. I arrived in the afternoon after an early morning flight to Dire Dawa (Ethiopia’s second city) from Addis Ababa. Tewodoros Hotel was my choice of budget accommodation in Harar I asked for room 117 or 118 for a view of the hyenas crossing the football pitch at night. The room was clean and tidy with en-suite hot showers for 70 Birr (about 10 US $). There was a water shortage and an enormous smell from the common toilet for the ground floor rooms. The manager said, no problem the water shortage is fixed before the evening! I walked out of the hotel to Harar gate then I was about to go through the gate a lad turned up! I want to be your guide what do say? This was one of the so-called plonkers! For several years I have used Hilleberg Namattj 2 during my travelling in Europe, Africa and South America. The main reason for choosing the tent was the low weight only 2.4 kg / 5 lbs 3 oz, I usually have problems with too much luggage weight when flying to other continents! The keron 1800 outer fabric is extremely strong an withstand very strong winds in high exposed areas. I have used it at high altitude at 5000 m in South America, in the jungle of Amazonas, in Kalahari in South Africa. It has been used in very cold weather -20 degree Celsius and very warm weather as well 38 degree Celsius without any problem.